Can carry daily necessities. Such as umbrellas, mobile phones, purses, cosmetics, ipad and so on. Commitment to all goods are taken in kind, quality assurance, manual measurement 0.4~1.2in error, due to the different display and photo light and other irresistible factors, color can not be completely avoided. DIMENSIONS:11.8"L x 11"H x5.9"W, Height of Handle. 6.7". the weight is 1.2 lb. please mind the size before place the order. STRUCTURE:There is a zipper pocket on the back of the bag. Inside is a whole pocket, not separated. On one side has a zipper pocket and the other side is a two-opening small pocket. Features：Dual carrying handles，The handle is not removable. 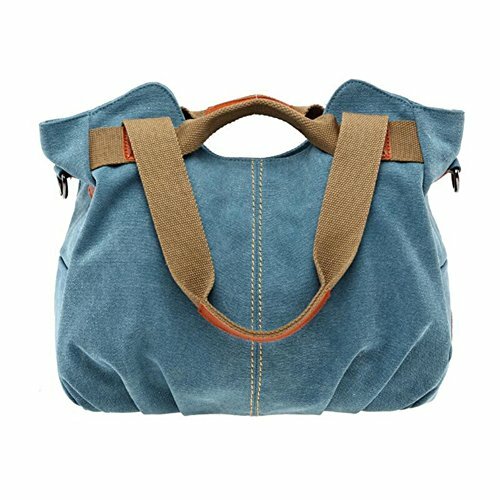 There is a detachable and adjustable length canvas strap.Can be used as a handbag or shoulder bag.The bag is closed with a top zipper, which protects the items in the bag. Please allow little color difference due to different camera or light environment.Accept returns or exchanges if you're not satisfied with it for any reasons. We promise that we can give you a good solution. If you have any questions about this product by Pahajim, contact us by completing and submitting the form below. If you are looking for a specif part number, please include it with your message.